A mild acid that can be both a cooking ingredient and a household cleaner, vinegar is somehow both omnipresent and yet undervalued. Usually reserved to vinaigrettes, there are so many more uses for your vinegars that you’ve likely been missing out on. Whether your pantry features a slim selection of vinegars or is packed full of barely touched bottles, did you know that no two vinegars are exactly the same? A willy-nilly swap of rice vinegar for balsamic vinegar will surely not end well—but why? And what even is vinegar? With knowledge comes power and knowing which vinegar to use in the various cooking situations you might find yourself in will both give you a confidence boost and boost the flavor of tons of dishes coming out of your kitchen. A product of not one, but two fermentations, at their core vinegars are a combination of acetic acid, water, and a mixture of vitamins and mineral salts that result from the aforesaid fermentations. The base ingredients can, and do, vary, but the process of making a vinegar is usually the same, straightforward process: alcoholic fermentation (using yeast to convert sugars into alcohol) + acid fermentation (using yeast and acetobacter to convert the alcohol into acetic acid) = vinegar! Traditional vinegar production usually relies on slow fermentations that can take anywhere from months to years, but of course industrial vinegars take much less time—and are therefore lower in both quality and taste. The base of flavor that makes a vinegar taste unique, not just a sour shock to your palate, is the original sugar that’s used to initiate the first fermentation. Grapes, rice, and apples are the most common, but practically any fruit or vegetable with substantial natural sugars, plus grains like barley, and even honey, can be used to make vinegars. With that in mind, let’s get familiar with the everyday vinegars you’ll probably come across in the kitchen! Cooking with vinegar isn’t easy. It’s a highly acidic ingredient that can heighten savory and sweet flavors, cut saltiness, help to balance fattiness, and even work to tone down heat. While these are the most commonly used vinegars (in alphabetical order mind you), not all are essential— there might even be others you pick up and start to depend on in the kitchen, so of course, feel free to pick and choose to create your perfect home vinegar reserve. We’ve also offered some ideas for substitutions but note that vinegars can also be replaced by lemon or lime juice for balance. The flavor will of course be different, so keep flavor pairings you already know and like in mind when substituting. A relatively mild vinegar made from, you guessed it, apples or apple cider (even the hard stuff!). This is a great vinegar to have on hand because it’s cheap, a little bit sweet, and usually comes unpasteurized—meaning you can use it to make your own vinegars at home (more on that later). It works just as well in braised meat dishes as it does in dressings and as a tenderizer for cakes. Plus, homemade ketchup would be nothing without it! Balsamic vinegar is unique in the world of vinegars. Made in Italy from Italian grapes, usually Lambrusco or Trebbiano, balsamic vinegar is a slow, intense, caramelized reduction of the grape ‘must’, or crushed juice, that is aged in barrels. It can be aged anywhere between 12 and 25 years to be a traditional balsamic vinegar. The longer they’re aged, the thicker and sweeter they get and some D.O.P. certified vinegars can cost up to $150 or more per ounce! White balsamic vinegar is made using the same process as traditional balsamic vinegar, but the grape must is only reduced, not caramelized, and therefore keeps its golden color. It’s also usually aged for less than 12 years, resulting in a sweet and sour vinegar with a less syrupy consistency—although some white balsamic vinegars can take on a thicker consistency. A deep dark vinegar with a malty, woody, often even smoky flavor, black vinegar is most popular in Chinese cuisine—where it often reigns as a punchy condiment or an inky component of braises and glazes particularly in southern China where it’s referred to as Chinkiang (or Zhenjiang) vinegar. It’s made from rice or other grains, or a combination of both. There’s also a closely related Japanese version called kurozu, which is made from only rice and is not nearly as dark as its Chinese counterpart. Both are fermented in a closed crock until it takes on their rich color, however they’re actually quite mild in taste. With practically no discernible flavor other than acid, distilled white vinegar is made from a distilled alcohol (usually from corn or another grain) and is then diluted with water. It’s super cheap, looks like water, and is the go-to for most vinegar-based cleaning—if you’re interested, here’s how to make your own all-natural kitchen cleaner. Since it doesn’t have a flavor on its own and is very strong and biting in large quantities, only use it small quantities when cooking with it. It can be added to milk to create a buttermilk substitute and is often used as the main vinegar for pickling or brining foods. Outside of apple cider vinegar and balsamic, red wine, or white wine vinegars—which are all made from fruits—there are a ton of other varieties of fruit vinegars on the market, you just have to know where and what to look for. From salty Japanese umeboshi vinegar (also called ume plum vinegar) to specialty banana vinegars (yes, they are out there! ), fruit vinegars can range in taste, color, and, of course, best uses. There’s no rule as to how you should use them, so build your collection based on taste and experiment with pairing things together to highlight and complement flavors in a dish. Raspberry vinegar is a popular niche vinegar, so try out these recipes for an introduction to the world of fruit vinegars. Malt vinegar is, unsurprisingly, made from none other than malt—the germinated grains, usually barley, used in beer production. The companion to many a fish and chip meal, malt vinegar has a toasty, nutty flavor profile. Some high-quality malt vinegars are made directly from beer instead of malt and have a more distinct, malty flavor. Look for “beer” on the label instead of the usual “malt” to try it for yourself. It’s most commonly used as a condiment but you can try it out as a substitute for apple cider vinegar in the recipes below. Most commonly used in Asian cuisine, rice vinegar is light and just a little bit sweet with a natural rice flavor—it is made from rice after all. It’s a milder vinegar than many of the others we’ve covered so far, making it great for adding depth to various marinades, sauces, dips, and dressing. There are lots of different kinds of rice vinegar, including seasoned and unseasoned. Seasoned rice vinegar is typically used for flavoring things like sushi rice and contains added sugar and salt. Unseasoned rice vinegar is the classic rice vinegar made from fermented rice wine. 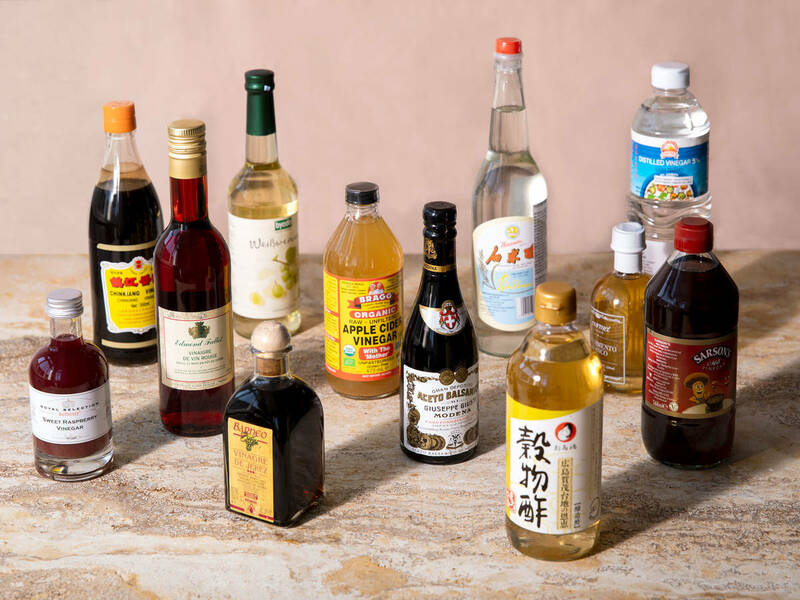 Chinese, Japanese, Korean, and Vietnamese rice vinegars are all worth experimenting with for different flavor profiles, but the ones you’ll most likely find in the supermarket are of Chinese or Japanese origin. When we think about wine vinegars, we most likely are thinking about red wine and white wine vinegars—though you’ll even find champagne vinegar on the market. Delicate and unique in their own rights, red wine vinegar is subtly fruity and sharp whereas white vinegar leans toward tangy and tart. Both are great for vinaigrettes and various sauces from homemade Bernaise to romesco. The workhorse of the vinegars, wine vinegars are reliable substitutes for other vinegars and staples in their own right. Sherry vinegar is made from none other than sherry, a fortified wine from southern Spain, sherry vinegar is similar to balsamic vinegar as it can take on tons of different tastes based on age and production and it is protected by the D.O.P. certification. Different Spanish grapes can be used for unique flavor, and ages can range from 6 months to 10 years in wooden barrels. They are usually richly caramel in color but not thick. They have a unique nutty and sweet flavor that plays well with most Mediterranean and Basque recipes like lush bean dishes, hearty and spicy stews, or thick, creamy purées. As always, try to avoid those with caramel coloring or other additives. While the convenience and rich flavors from years of expertly produced, bottled and aging vinegars will be hard to reproduce, you can indeed make your own vinegar at home. It’s not hard, but it does takes some dedication and attention to get it right. If you’re not up for going all in to make it from scratch, try infusing store bought vinegars for new flavors. You can purchase a vinegar mother (this is the bacteria culture that creates vinegar) online or simply use unfiltered raw vinegar (like Bragg’s apple cider vinegar) to get the fermentation going. Combine 3 parts red or white wine to 1 part raw apple cider vinegar in a glass container. Lay a clean kitchen towel or cheesecloth over the top and secure it with a rubber band. Store the mixture in a dark place and stir it and taste it at least once a week to check the progress. It could take anywhere between several weeks and several months to taste like the vinegar you want, so keep going until it reaches the sharply acidic, truly vinegary point. Once it’s ready, pour most of it into an airtight bottle for use, and set the rest aside to kick-start your next batch. As we’ve tried to show throughout our guide, vinegars are made for braises, sauces, vinaigrettes, and soups. They add depth, acidity, rich flavors, and even glossy colors. But vinegars can be used in more than just savory cooking preparations. Here are our favorite odd jobs for the humble ingredient—enjoy! Do you know the trick to a flaky, tender pie dough? Apple cider vinegar! You heard us right. Just swap a tablespoon of cold water out for a tablespoon of chilled apple cider vinegar the next time you whip up a fruit pie, and you’ll forever harbor (or share) your secret to the very best pie dough. Balsamic vinegar pairs perfectly with fresh fruits, but did you know you can use it in cakes, too? Our roasted strawberry cake is a perfect example. Drinking vinegars, also called shrubs, are a great way to not only use up some leftover vinegars, but create unique cocktails or mocktails. First make a simple syrup by combining one part sugar and one part water in a saucepan and heating it until the sugar dissolves. Add one part fruit of your choice (berries are great here) and simmer until the fruit blends well with the syrup. Let the mixture cool before adding one part vinegar. Try it out in fruity summer cocktails or simply splash the syrup with club soda or seltzer. Did you know you can make buttermilk at home? It’s super easy, and one of our favorite ways to use vinegar to make magic. Simply add a tablespoon of vinegar to a cup of milk and let it sit for five minutes. Use it as you would buttermilk! White distilled vinegar is used in cooking but is perhaps much more versatile when it comes to cleaning up your home. Use it to clear out and deodorize drains, clean microwaves, windows, to remove limescale from coffee makers, kettles, showers and showerheads, as a spot cleaner for carpets and clothes, to wash fruit stained hands, as a fabric brightener, rust remover, or weed killer. The list goes on! Check out our guide to natural kitchen cleaners for more. Another versatile vinegar that can serve purposes outside of the kitchen is apple cider vinegar. Use it as a hair rinse to remedy dandruff or shampoo build-up, rinse your mouth with it for a natural mouthwash, or even use it as a natural face wash.
What's your favorite type of vinegar? Have a tip or trick we haven't covered here? Share with us and the community in the comments below!